The vine is a plant of temperate climate, and the best wines are produced on not too rich soil, well-drained and preferably on sunny hillsides. In almost all countries where the geo-climatic conditions are favorable, there have been planted vineyards on land that originally contained thermophilic woods or species rich meadows. Those plant communities, wich are often of great importance for flora and fauna, have been supplanted by the rows of vines. But in the traditional way of vineyard cultivating, especially in the old wine country’s like Italy or France, the vineyard still was a favorable habitat for many species. As a climber, the vine plant need a pole or a tree to climb on. In the traditional way of vine culture was the grapevine often “married” with a living tree. Species like the elm tree, manna ash, veld maple, and willow where used not only to support the vine grape, but they also provided the farmer with wood, leaves for the cattle and flexible branches for the vines to tie. Fruits trees like the apple tree, the pear tree or the walnut tree where also used. With their edible fruits they supported the economy of the farm. The work of clearing and hoeing were mostly manual, often in a small-scale production. Mowing was doing with a scythe and hay was supposed to feed the farm cattle. Those methods of work left enough environmental niches for a rich biodiversity. The need to step up the production, and lower manufacturing costs with mechanization, has led producers to rationalize their work in the vineyard. This has resulted in the replacement of trees and wooden poles with cement poles. Grasslands under the rows is constantly shredded, deleted with the weeding or in the worst case, poisoned. Of course, this means a sterilization of the vineyard. Animals and plants have very few possibilities of settlement. The agricultural methods to produce wine, on the same way as other intensive agricultural productions, are designed in one direction: the farmer works the land, sows or plants his crops. During the season he fights the natural life like insects, fungi, animals, wild herbs or weeds as they are called in jargon. Collect the products of the season, sale, eat and drink them. If it all goes well. Of course, if you do not cut the grass, or not cultivate adequately the vineyards, there will be a very poor harvest, or, in the worst case, nothing at all to collect. But, there will be a way to produce our wine, and on the same time, support the biodiversity of our planet. Coming to the point, a vineyard grows in sunny areas, where before the vineyard probably grew a meadow or a forest. The forest we can’t have back, but the meadow with its diversity’ in flowers and insects may still grow under a vineyard. In certain vineyards there are a good number of species of flowering plants, especially in old small family vineyards, but in most cases, through the mechanical shredding of the vegetation, the majority of the species will disappear and the vegetation be dominated by grasses or species like nettles or thistles. Vineyard on the hills of the Montello, Italy. I will try to suggest a few work methods to make a vineyard “flowered” and biodiversity-rich. When we start from a meadow, we can choose a low impact approach. Just bringing a minimal disturbing to the ground. Mowing the meadow and prepare the ground only where the row of vine grape plant will be planted. Where the soil is poor and dry, like it will be on some sunny hills, it will be not necessary to disturb the earth with mechanical cultivators. Planting the vines in autumn, they will have all the winter to settle. Mostly, like with sunny hills, they have a species rich vegetation and they don’t need any “empowering” like introducing some species. This method, wich we can call the “Low impact system’ has the benefits that we live the life of the soil intact. When I was vine farmer in Italy, I used to work in a renowned wine company in the North of Italy, the Loredan Gasparini Venegazzu . Situated in the well know wine region Veneto. I remember the oldest vineyard of the company, where the main grapes of the best red wine of the company came from, the famous “Capo di stato”. It was a mixed vineyard, with malbec, merlot, cabernet, franc, and cabernet sauvignon grapes. 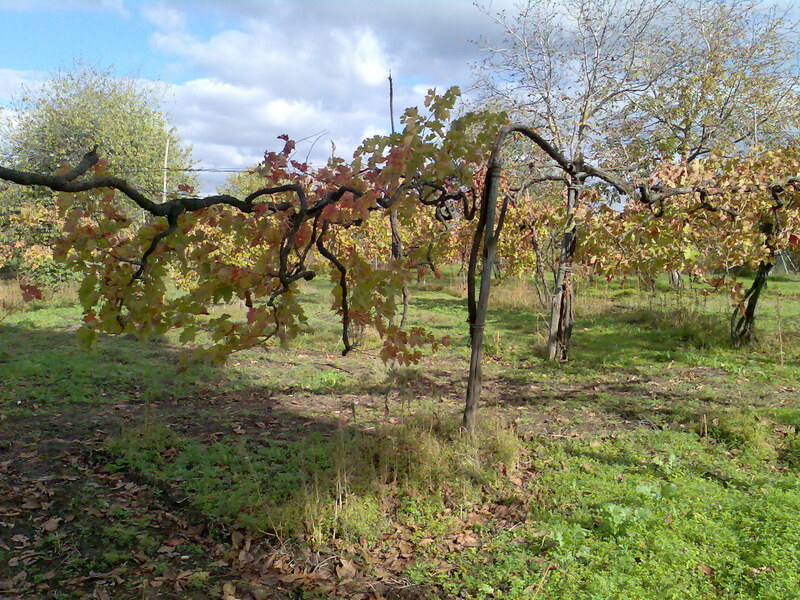 The vine plants where very old and disorderly grown, and the soil never worked with machinery. 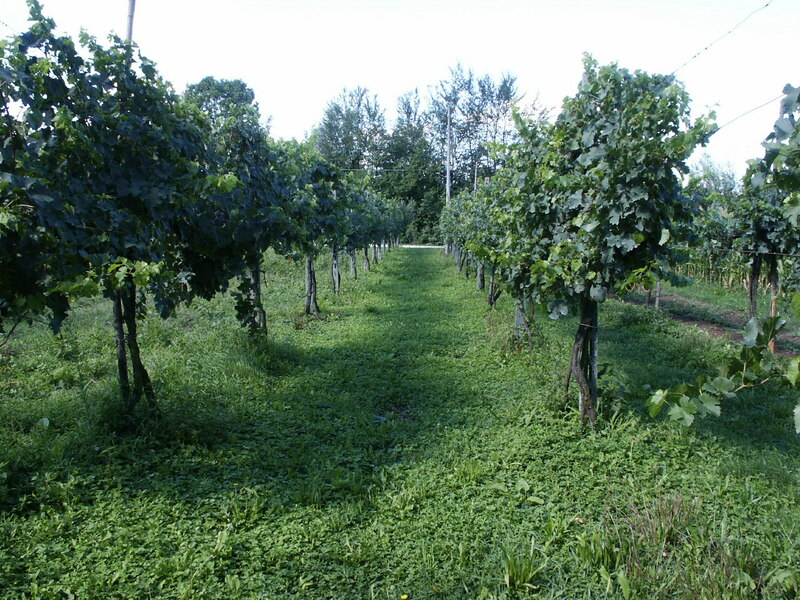 It was a beautiful and natural looking vineyard, with a typical species rich meadow. This old vineyard didn’t produce so much wine as the younger and intensively maintained vineyard’s of the company, but the wine of this old field was great! Sometimes is necessary to work the soil with machinery. This situation brings some chance that we can take to reach our purpose. The ground is naked, all the vegetation has been deleted. This situation is favorable to plant the vine rows, but is also ideal to sow a mixture of plants that in the following years will protect the soil and give color to the vineyard, attracting butterflies, bees, and other insects. This vineyard, as well as having a greater landscape value, gives a contribution to the restoration of nature in all its forms, without affecting the historical and economic value of culture of the vine. The first year will the flowering annuals give a picturesque look of the vineyard. Annuals such as poppies and cornflowers for example. The perennials will follow the next years. Through mowing the meadow at the right time, and draining the hay we will wither away the soil and the need to mowing will decrease during the years. Taking care of a vineyard is a good job, especially in the traditional way. It is a physical work that demands knowledge and passion. The harvest of the grapes is an awesome moment of the season, of course if the grapes are healthy and have ripen well. The maintenance of our biodiversity-the rich vineyard is not much different than the traditional way of the old farmers. The difference stays in purpose. With a knowledge of the local flora and fauna we can combine the consciousness of the importance of wildlife with doing our job, and at the end of the season, celebrating our amazing wine.